Faveo is specifically designed to cater the needs of startups and SME’s empowering them with state of art, ticket based support system. In today’s competitive startup scenario customer retention is one of the major challenges. Handling client query diligently is all the difference between retaining or losing a long lasting relationship. The software is free of cost. Managing tickets is easy and also sending updates to the end users is quite easy. The support is not that good. The option to customize the software as per our needs is not as easy and has a lot of bugs in terms of creating automated tickets. If you are looking for a free tool then go for it. As a free tool, they are doing a good job. Recommended as this serves the purpose and is also free of cost. This is a ticketing tool used by our engineers and helpdesk team for connecting to the end users and solving their issues. The benefits are that the end user issues are rectified and also they are updated on the status of the issues they have raised. It has a good UI and a built-in knowledge base. We have run into problems that are hard to troubleshoot. The product is young and going through many changes. Because of this, it can be unreliable. Keeping a knowledge base and managing customer tickets. I loved faveo helpdesk. Its one of the best helpdesk for ticketing and support. Nothing is for dislike everything is perfect in that software. Freshdesk is a cloud-based helpdesk software that streamlines customer conversations across multiple channels including email & phone. It enables faster collaboration with your support team for quick responses to your customer. With 150+ integrations, we make it simple for businesses to provide superior customer support. We are trusted by 100,000+ companies across different industries. The Service Cloud is a social customer service application, built on a SaaS model, that empowers companies to manage all customer information and service needs. Give customer support by email, social media, voice, and mobile phone with complete data reporting, TRUSTe certification, and 90+ integrations. 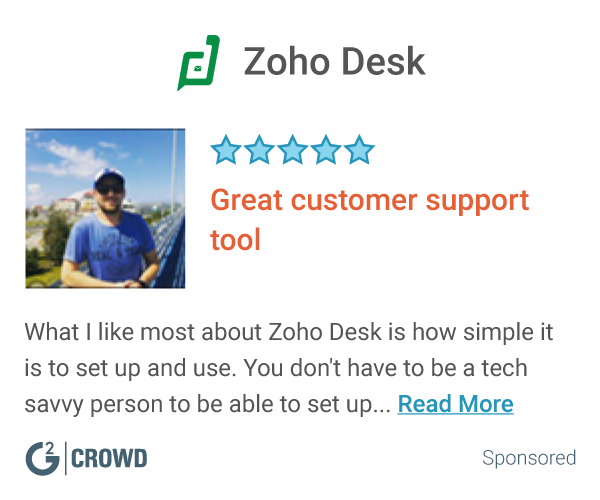 Zoho Desk pulls in all your customer interactions from across multiple channels into a single, clean interface. You can then seamlessly continue these conversations and help customers easily. LiveAgent helps businesses provide better customer service across all communication channels including email, chat and phone. Deliver customer Wow and grow your business with LiveAgent, a customer service software trusted by 30.000+ companies worldwide. A powerful customer support suite with a focus on collaboration. Hiver turns Gmail into a simple, powerful collaboration and customer support tool. Kayako is effortless email, live chat, and knowledge base software that helps teams be more productive and build customer loyalty. Messaging-based customer service platform leveraging Bots and AI. Delivers personalized, scalable customer service in your mobile apps, websites and other digital channels. Dramatically increase CSAT and lower cost to serve customers. * We monitor all Faveo HELPDESK reviews to prevent fraudulent reviews and keep review quality high. We do not post reviews by company employees or direct competitors. Validated reviews require the user to submit a screenshot of the product containing their user ID, in order to verify a user is an actual user of the product. Hi there! Are you looking to implement a solution like Faveo HELPDESK?